When I first saw these dies, I knew I wanted to make some "silver lining" cards. First I used a Power Rays die cut as a mask to create the sunday background. Then I reverse die cut the clouds into that panel. Instead of inlaying the entire cloud, I just inlaid the silver outline of the cloud. I added vellum to the back of each cloud and made little shakers for each of them. I love the look of the large silver hexagon glitter behind the vellum. Almost like the clouds are holding the raindrops! This second card I have to show you today is a Christmas card. I love all kinds of Christmas stamps and cards. Traditional, modern, funny, fancy. I enjoy and make all kinds, but I have to say that the new A Blessed Christmas stamp set has quickly become my go to set this year! Sometimes, understated is the best:) I stamped the holy family image and did very minimal coloring with Copics. Then I masked it off and blended a silhouette of the Cityscape 1 behind. Such an easy technique, but I love how it gives the city a soft glow. As always, your cards amaze me. Love the shaker clouds you created in the first one. 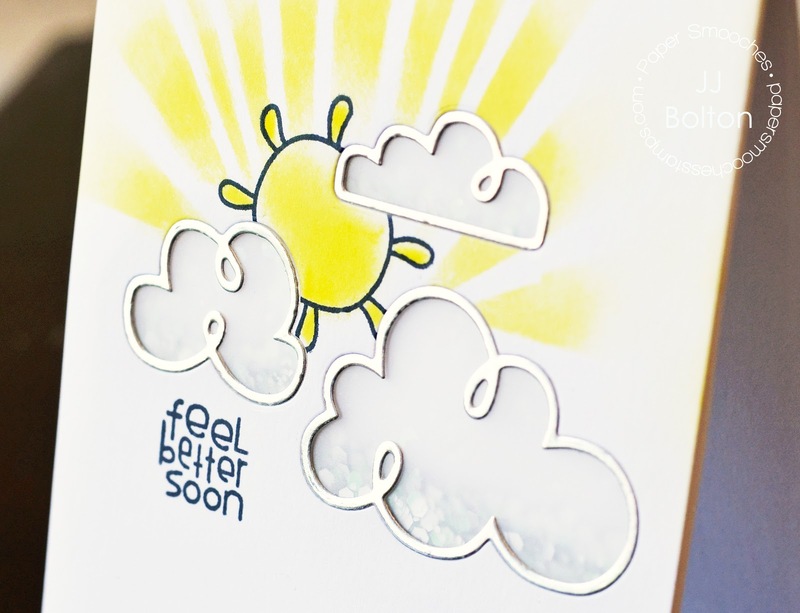 The silver lining is perfect for a get well card!! And I just can't believe how beautifully understated your holiday card is. Stunning! Oh, my goodness, I am in LOVE with that first card! So fabulous!!!! The second one is super pretty, too! 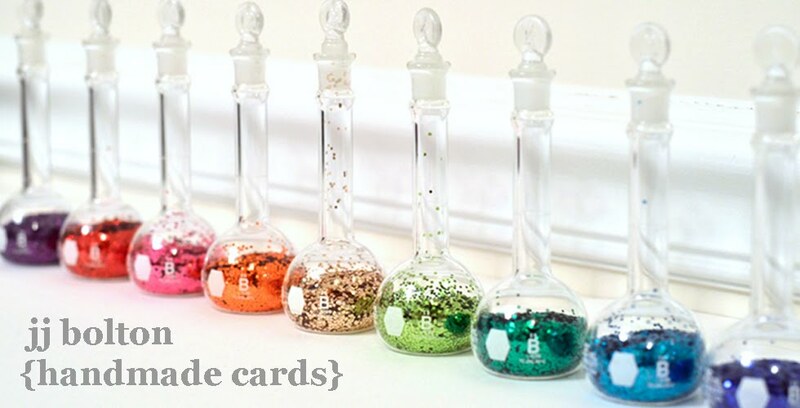 Fab cards, JJ! I'm smitten with those "silver lining" clouds! Genius! I love the silver lined clouds and that you used vellum for the front of the shakers and that second card is so sweet, love the soft inking of the skyline! the silver lined clouds and the glitter behind them is awesome! These are totally, awesome and amazing!!! Love! Two gorgeous cards, JJ! I love how you created the silver lining for your clouds and how you inked the sun rays! What a clever idea you had to create a silhouette behind the holy family on your 2nd card! So soft and pretty! love. Love. LOVE the shaker clouds w the silver lining and the sun's rays behind them! sweet! thanx for the inspiration! Both are wonderful but WOWZA on the shaker card. JJ, seriously, you are GOOD!!! The vellum behind the clouds, and a shaker behind that ... what?!? And man oh man, the stenciled city behind the holy family is just inspired. What a great story it tells! Oh what a teat you have for us today.... Love the shaker clouds but the silver linings are just brilliant!!! Gorgeous!! LOVE how you did the clouds on the first card, genius! wow just love those embedded clouds on the first and the softness on the second.